I wasn't feeling well yesterday. I spent just about the entire day laying either on my bed or on the couch with my heating pad tight around my tummy. By the evening, I had started to feel better and wanted to escape my apartment. I got onto Citybeat to see what was going on around Cincinnati that evening. 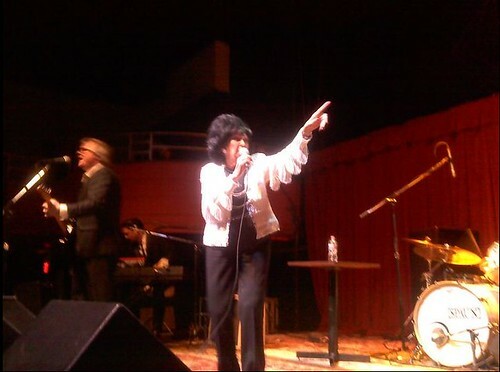 And what did I see, but a Wanda Jackson concert across the river in Newport, Kentucky. Honestly, I'm a new Jackson fan, coming in with her last album, The Party Ain't Over. I've had very little exposure to her work pre-Jack White, so this concert was a good introduction to much of her earlier work. She did sing her classics, as well as some of the new songs, including "Shakin' All Over" and her cover of Amy Winehouse's "You Know I'm No Good." The woman is 73 years old and still going strong. The show was energetic and fun. You could tell that many in the audience had been fans for years, even though many were my own age (in other words, many of our parents weren't even alive when she started). She even managed to give some of a history lesson during the show, talking about what was going on in her life around the time that the songs were initially released. She talked about be mentored by (and dating!) Elvis Presley, transitioning into rock 'n roll from country and even her acceptance of Christianity, which did happen to turn some fans off, as one man very loudly proclaimed (I don't think he realized how loud he was talking). I'm definitely going to start exploring her back catalog. She seems to be a very gracious artist and had a great rapport with the fans. Oh, and by the way, I touched the queen of rock 'n roll's hand!! !